I have two new summer tops in my wardrobe. Today I want to show you these tops. I designed and made them myself. I like them very much, they are perfect for a hot summer days. These tops look similar to each other but they are different. The red one is more difficult to sew. The patterned one is very easy to sew, good for beginners. I am sure everyone can successfully make it. I used a 100% cotton fabric to sew the red top. The top edge and the bottom edge of the top has a frill. I made two tunnels (under the bust line and above the bust line) for the 1cm thick elastic to improve adjustment to the body. I added four rows of elastic shirring under the bust. In the middle of the front from the left side of the top I sewed in the a small tunnel (the eye) so you can pull the drawstring in. You can tie the drawstring on your neck to improve comfort of wearing. Of course the drawstring is optional and it is easy to remove. Here I am presenting the red top with drawstring tied on my neck. The back of the top. I made the patterned top from 100% cotton fabric. The top has two tunnels for 1cm width elastic too. Above the upper tunnel I sewed in a thin frill. 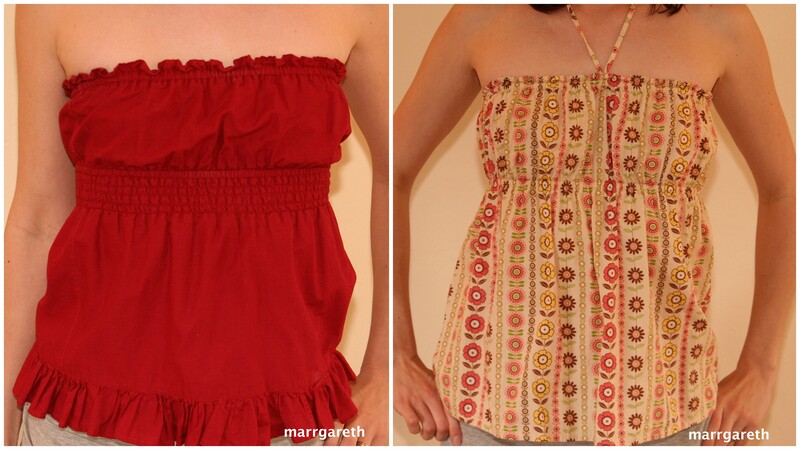 This top has the drawstring too as an option, is very easy to sew. I recommend this top for beginners. very cute, you should be ready for the summer in this! Ooo yes, I am ready for this summer. Awesome tops! Do you sell anything you make? I do not sell cloths that I make now, maybe one day it will happen. These tops are absolutely adorable! I love the optional drawstring idea. Beautifully made. They look as they were bought at the store rather than made at home. Well done! These are lovely. What a good idea. These are great! I especially like the patterned one. Is that a Japanese print? Love it. Where can I get the instructions for the 2nd summer top. I love it! I am very sorry, I do not have the instruction for this top, this top is all my idea.